1The presence of Muslims in Belgium, and a fortiori in Brussels, is the result of a relatively recent historical process – the massive call for foreign labour launched in the 1960s by the Belgian authorities at that time as part of the migration policy.1 As decades went by, the Muslim population has gradually grown significantly due to the effects of several factors: the natural birth cycle, grouping of families as stipulated in the agreements and encouraged by the Belgian authorities to promote integration, marriage of Belgian Muslims (men and women) with partners from the country of origin, political refugees, conversions, illegal immigration, etc. 2Nevertheless, because national statistics do not include any information on the religious affiliation of the population, it is still extremely difficult to have an accurate idea of the number of Muslims living in Belgium today and, a fortiori, in Brussels. Consequently, the best we can do is to use orders of magnitude, and estimates based on an extrapolation of the number of people who immigrated and their descendents. This problem has been mentioned by many researchers, both in Belgium (Dassetto, 1997) and in other European countries like France (Boubeker, 2006), for example. 3In this context, the most recent estimates put the figure for the number of persons of Muslim confession in Belgium between 350 000 and 370 000, corresponding more or less to 4% of the population, and including between 6 000 and 30 000 converts from Belgium or another European origin (Aksöyek, 2000). The vast majority of this population (more than 90%) stemmed from immigration (Manço, Kanmaz, 2004). In Brussels specifically, the Muslim population is estimated at approximately 160 000 persons, representing 39% of all Muslims in the country and nearly 17% of the total population of Brussels. This makes Brussels “one of the most Muslim cities in the Western world” (Manço, Kanmaz, 2004). 4These estimates have at least two major disadvantages, however. First, these figures presume that all immigrants from countries where Islam is the dominant religion are Muslim, and so are their descendents, whereas in fact some of them may belong to other religions (certain Muslim countries have or had large Jewish and/or Christian minorities for example) or be nonreligious. In fact, there are many facets of Muslim affiliation: the consequence of the civilization without religious signification for some, foundation of a code of ethics for others, ritualization of life for still others, or even the basis of a political ideology (Dassetto, 1996). It should be noted that in this article, we will be using the terms “Muslim” and “Islamic” with reference to Islam as a religious belief2. 5Secondly, the figures extrapolated do not reflect the diversity of the Muslim populations in Brussels. One way of avoiding these handicaps consists of taking account of the diverse origins and ethnic groups of Muslims in Brussels. More than 70% of Muslims in Brussels are Moroccan or of Moroccan origin, 20% are Turkish or of Turkish origin, and the remaining 10% represent Albanians, Pakistanis, Egyptians and other North African nationalities or origins (Tunisia, Algeria, etc.). But it seems to us that another way of breaking with “une appréhension globalisante ou abstraite des réalités musulmanes” (a global or abstract understanding of Muslim realities) (Dassetto, 1996) could be to map the Muslim associative fabric. In fact, compared to other types of cultural or political associations, Muslim associations probably have the strongest capacity for organization and orientation from the quantitative standpoint (Dassetto, 1997). Since this is the case, we feel that the map of the Muslim associative fabric that we are drawing here, based on the results of several databases and observations in the field done between June 2004 and June 2006, can provide be a helpful contribution to the knowledge of Muslim populations in Brussels. 6A simple analysis of the data of the National Statistics Institute on the population living in Brussels whose nationality corresponds to a country where Islam is the dominant religion, shows that this population is highly concentrated in certain municipal districts and certain neighbourhoods. In fact, nearly 75% of this population lives in only five of the 19 municipal districts in the Brussels-Capital Region (BCR): Anderlecht, Brussels-Centre, Molenbeek, Schaerbeek, Saint-Josse. 7This concentration of the Muslim population in the Brussels Region stems first from the history of migration itself: migration for work, meaning that migrants set up in certain neighbourhoods in the urban area. The immigrant workers initially settled in near their place of work (particularly for Brussels in the building industry) or emigrated to town during the economic recession in the 70s. Muslim immigration concentrated in priority in urban areas, given the functions assigned to populations of Muslim origin at the time of arrival of the first migrants (Dassetto, 1996). The current breakdown of the Muslim populations on the regional scale therefore reflects the economic role of immigration from North Africa and Turkey (Kesteloot et al., 1997). 8The concentration of Muslim populations in Brussels is then due to the social-spatial and residential structure of Brussels as an urban area. In fact, Muslim migrants have moved into affordable, working class urban residential areas. And it so happens that in Brussels these neighbourhoods are in the centre of the city. This spatial structure itself is the consequence of historical factors dividing the town into an “upper” part, that is more affluent, and a “lower” part that it is more working class, thus determining where the social groups set up. Major urban constructions and renewal of the town (such as the construction of the large boulevards in the centre, for example) pushed industry and the working population towards the west and the canal, whereas the affluent part of town extended mainly to the east and the South (Merenne et al., 1997). It is hardly surprising to see that the population coming from a country where Islam is the dominant religion concentrated in the poorest municipal districts in the region, in other words those where average income per tax declaration is lower than the regional average4. 9The concentration of Muslim populations in the Brussels region also corresponds to the economic evolution that took place in the 1960s and 1970s. Economic growth in the 1960s brought a net improvement in the standard of living of certain social groups. This economic improvement favoured their social ascension and enabled them to move into new areas. 10To this was added the fact that the Belgian state enacted a policy promoting home ownership during that same period, and many families left town to build homes in the suburbs where they could afford the cost of building lots (Kesteloot et al., 1997). At the time, a very large majority of Muslim families belonged to categories of the population whose more precarious socialeconomic conditions blocked any possibility of spatial mobility. 11Consequently they stayed in the same neighbourhoods, even when jobs gradually left the zones where they had initially settled (Alaluf, 1993). The oldest neighbourhoods in the Brussels town centre were gradually abandoned by the upper classes and by part of the working class for whom conditions were such that they could aspire to a better environment, and were taken over by immigrant populations and lower working classes that were unable to follow the suburbanization movement (Kesteloot, 1990). The economic recession in the 70s, and the increasingly precarious economic conditions that followed, further limited the possibilities of social and spatial mobility, thereby consolidating the presence of Muslim families in these neighbourhoods. The growth in the number of homeowners among Muslim families also reinforced this trend. (Kesteloot et al., 1997). 12Finally, the zones where Muslim immigrants and their families concentrated were also a witness to the discrimination experienced by these populations on the housing market, as well as to the solidarity networks maintained or created in these areas. In fact, in certain municipal districts measures were enacted refusing to register new arrivals. The refusal to rent to foreigners, selective policies in awarding social housing, etc., were also elements that had a significant effect on this concentration phenomenon. Today, these old working class neighbourhoods in the first circle and part of the second circle encompassing the downtown business area to the west, form what is often called the “crescent” or the “banana”, where the highest concentrations of Muslim families are found. 13Within a few years, the Muslim populations in Brussels would create a dense, diversified fabric of associations. Being of the Islamic faith is thus reflected in the public area in “visible, organized forms” (Dassetto, 1997). 14The development of these immigrant and Muslim associations would go through several phases. In the first decade, running from the 1960s to the 1970s, the immigrant associative movement would develop a whole series of activities of a social and cultural nature (education, acculturation, sports, artistic expression, etc.) on one hand to fill the gap in the infrastructures organized by the authorities for the reception and hosting of these populations and, on the other hand, to reconstruct a common social life, notably by celebrating national and religious holidays (Ouali, 2004). These activities would benefit from the support of the Belgian trade union movement at a time when that movement was relatively strong. 15But with changes in economic, social and political contexts, several factors would bring the immigrant associative movement to situate its demands in the social-cultural field and then, gradually in almost exclusively in the cultural area. In fact, the economic context in the 1980s was difficult and this period was marked by real “institutional racism” at political level (Rea, 1999). The specificity of the migrant situation was what created the first need for religious structuring, but subsequently, reforms in the nationality code, repetitive issues focusing on wearing the Muslim headscarf, complications pertaining to the institutionalization of the Muslim religion as well as the appearance of political Islamism on the international scene transformed the social-economic demands made by immigrant workers into cultural demands expressed by Muslim citizens. 16During this period the development of mosques, that had begun with the official recognition of the Muslim religion in 1974 (Ouali, 2004) became more intense. The strictly religious dimension of this population was hardly felt in the first decade of the installation phase in Belgium. It amounted at the most to the opening of a few prayer rooms, as religious practice was essentially confined to private areas and associated with certain moments in the life cycle (Dassetto, 1990). For public opinion, it was almost unnoticed. (Manço, 2000). 17The religious dimension began to be more visible from the outside due to several factors. First, because of the economic recession that hit sectors in which immigrants were working, more and more of them realized that going back to their country of origin was financially impossible. In addition, an official halt to the import of immigrant labour increased awareness that, if they were to go back, it would be very difficult if not impossible to return to Europe. Finally, family grouping, stipulated in the agreements signed by the Belgian authorities, reinforced the Muslim immigrants’ idea of a permanent settlement. At that point, the question arose of transmitting religion to the children. In other words, adult men who hoped to go back home did not express a strong need for religious structures, whereas the presence of women and particularly children in an environment where Islam is not the official religion heightened that need. Another noteworthy factor was the influence of a growing reference to religion in the Muslim world in general at the end of the 70s and the beginning of the 80s, after various failures of efforts to modernize. 18The Muslim populations also created cultural associations in order to promote the culture of their country of origin. And, for some years now, Islamic associations have been created either to aid Muslims specifically (particularly the case for Muslim social services, associations for international aid, etc. ), or to propose specifically “Islamic” activities (this is the case, for example, of associations of Muslim scouts). 19Alongside these associative activities, the importance of the commercial fabric of small businesses that survive on the basis of an ethnic trade at local level (travel agencies, snack bars, import export, grocery stores etc.) or more the broadly “ethnic-Islamic” trade (hijab stores, halal butchers, bookstores, etc.) must not be underestimated. 21These divisions traditionally prevent collaboration between the various trends present within Islam in Brussels. Although certain occasions may be opportunities for encounters (like meetings of the Muslim Executive or certain platforms for consulting mosques), still they cover only part of the issues. 22Although one might have thought that a certain number of elements (like the price of buildings, administrative difficulties, etc.) might have favoured the emergence of a Muslim associative fabric outside of town, this mapping project shows us that the Muslim cultural associations we have identified are to a very large extent concentrated in the same municipal districts as the Muslim population. Almost two-thirds of the associations identified are concentrated in only three districts: Schaerbeek, Molenbeek and Brussels- Centre. By adding the districts of Saint-Josse and Anderlecht, we obtain nearly 80% of the associations concentrated in only five districts of the Brussels-Capital Region, which are exactly the same as those that show a concentration of population whose origin stems from a country where Islam is the dominant religion. The prayer rooms and other associations are thus located in the immediate vicinity of the Muslim populations’ residential neighbourhoods (Boubeker, 2005). 7 As well as other possible spellings. 23How did we proceed to identify and locate the Muslim associations in Brussels? We did a search using keywords in a database of non-profit associations (ASBL) in the Belgian Official Journal to get addresses of associations and any changes in address or name. The keywords (in French, English and Dutch and certain terms in Arabic) that provided results can be broken down into three categories. First, a category that we can call general, that is related directly to Islam (keywords “Islam”, “Islamic”, “Muslim”, etc.). Then we used a category of more specific terms associated with various nationalities, countries and regions whose population can be considered for a very large majority to be Muslim (keywords “Moroccan”, “Turk”, “Algeria”, etc.). Finally, we used a third category of keywords in relation to national and/or Muslim religious minorities such as Shiite, Alevis, Kurd, etc. several terms associated with Islamic theology were also used, but without results (Koran, Sura, Ijtihad, etc.7). The search itself was done for the entire Brussels territory and gave results in 18 municipal districts (17 districts in the BRC, plus Neder-over-Hembeek). 24This search method clearly can only identify formal associations and can only take account of associations declared in the Official Journal as nonprofit associations. On the other hand, a certain number of associations active in the field are not constituted in the form of a non-profit association and function on an informal basis. Other associations exist only in de facto form and others are used as a front for different activities, particularly commercial activities (as is the case, for example, of cafés constituted in the form of non-profit associations essentially for tax reasons). In order to make up for some of these disadvantages, we completed this approach by making a certain number of observations in the field and doing semidirective interviews with representatives of Muslim associations. Finally we also compared these results with lists supplied by certain Muslim web sites. 25In addition to identifying the concentration of Muslim associations in the Brussels Region, our work on the Muslim associative fabric also gave us a more accurate view of the various types of associations existing in Brussels. Indeed, given the diversity of the associations we identified, we felt it was appropriate to identify three categories: mosques, Islamic associations and cultural associations. 26A “mosque” refers to a religious association constituted for the purpose of making available and managing a place of worship, whose activities focus on promoting religious activities, the practice and supervision of the Muslim faith. 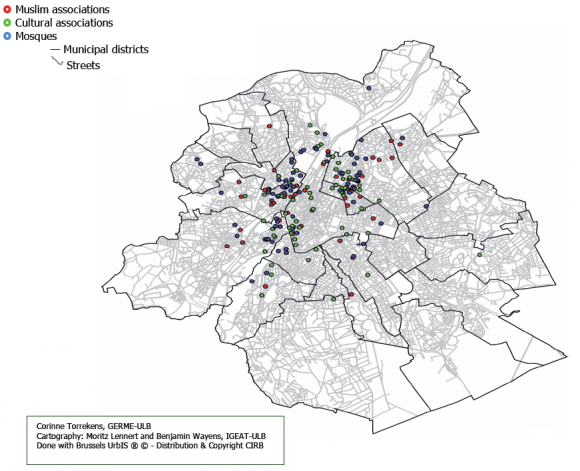 We identified slightly more than 80 mosques in the Brussels region; most of these are found in the Official Journal as non-profit organizations or are recognized in partnerships and advisory structures set up between municipal districts and the mosques. In Brussels, external visibility of these mosques is more or less marked in different ways (signs in Arabic and/or French phonetic translations, indications in French, mosaics, minarets etc.) or not at all. In the context of confirmed citizenship that expresses its demands, a growing number of Muslim worshipers are sensitive to architectural expression in mosques. This can be seen clearly in the special symbolic importance of the Islamic and Cultural Centre of Belgium, also called the “Mosquée du Cinquantenaire” or the great Mosque of Brussels for a significant number of practicing Muslims, because it is the only one that looks like a “real” mosque. Along the same lines, adding a minaret on the facade of a Turkish mosque in Schaerbeek, considered by the municipal authorities as a lighted advertising sign from the urban planning standpoint, whose only function is to increase visibility of a mosque in the neighbourhood (the call to prayer is formally prohibited) is considered by Muslims in the area as a symbolic mark of recognition. It is true that this evolution was criticized by certain Muslim leaders as a form of acculturation of the idea of a sacred place, an idea that these leaders do not consider to be fundamentally Muslim (Metcalf, 1996). But for many Muslims, the grandeur of mosques becomes symbolic, as a mark of the presence of Muslims in the public area, and the mosques are put forward as a Muslim contribution to the cultural heritage of a cosmopolitan city like Brussels. 27Then we were able to define “Islamic associations” as associations whose statutes refer to Islam or which contribute to promoting and teaching Islam, the Muslim faith or the Arab-Muslim culture, or again which organize socialcultural and sports activities in the context of the Muslim religion. This is quite a broad category, which for example groups associations offering specific services to Muslims (such as social services, aid, etc. ), or specific activities like courses, training or scouts, as well as federations of mosques, for example, whose main objective is not to make a place of worship available, but which group several associations to defend common interests or pool resources. 28These two categories of associations (mosques and Islamic associations) are what we refer to when we use the global expression “Muslim associations”. Finally, we define “cultural associations” as associations that refer to the culture of a country where the majority of the population is Muslim, to its promotion and to the organization of cultural activities, without referring to the Muslim faith as such. Various amicable societies (amicales) created to support workers or tradesmen are the prototype of this category of associations. Why did we retain a cultural criterion in this map? Mainly for two reasons. First, some of these societies were among the very first associations created by the first generation of Muslim migrants in the 70s and 80s. Some of them had a small prayer room that served as the basis for creating “real” mosques, particularly for the Turks. Some mosques in Brussels attest to this because the name of the mosque is associated with the cultural association that preceded it. In other cases, these may be general organizations that locally are combined with places of worship (Aksöyek, 2000). Secondly, the borderline between the religion and the culture can be quite hazy in the case of these associations. These associations integrate Islam as part of the description of their activities, particularly on holidays, because once the rituals have been made part of the collective memory, they become both religious and national, and result in an ultimate form of folkloric religion (Hervieu-Léger, 1993). Celebrations associated with religious practice can therefore be included in the range of their activities, among others celebrations during the month of Ramadan, the end of fasting, the feast of the sacrifice, etc. Consequently, whether participants in these associations give priority to specific social problems or exclusively religious problems, or again whether the associations are primarily national or regional, the term “cultural” appears in the name, or at the very least, in the statutes, (Kastoryano, 1996). 29It is true that our approach has at least two disadvantages. First, some of these associations may be addressed both to Muslims and to Christian or Jewish minorities that also came from Muslim countries and, secondly, the objective of these associations may not necessarily target Muslims exclusively as the audience in their social object. However, we consider that even if these associations do not refer to Islam directly, their role must not be underestimated. 30The three categories thus described constitute what we call the “Muslim and cultural associations” present in the territory of the Brussels-Capital Region. 31The objective of this article, which in no way claims to be exhaustive on the subject, was give an overview of the location of the Muslim populations and associations in the public area in the Brussels-Capital Region. Rather like a snapshot taken at a given time. 32This mapping project has also made it possible to describe the diversity of the Muslim associative fabric both by its divergences and by the activities that it organizes. By emphasizing specific criteria focusing on activities undertaken in this associative sector, this map helps discount the equation “Muslim Association = mosque”. 33Finally, the production of this map, which shows the extreme concentration of these associations in part of the territory of the Region, describes a specific layout of the territory that is an invitation to continue research with even greater acuity on the subject of the structuring of the urban landscape. I want to cordially thank Moritz Lennert and Benjamin Wayens from Institut de Gestion de l’Environnement et de l’Aménagement du Territoire (IGEAT-Université Libre de Bruxelles) for their help and their patience in developing the map. C.T. AKSÖYEK, A. (ed. ), Sociographie de la population turque et d’origine turque. Quarante ans de présence en Belgique (1960‑2000) : Dynamiques, problèmes, perspectives, Bruxelles: Centre de Relations Européennes, 2000. ALALUF, M. (ed. ), Les immigrés dans la ville : Trajectoires migratoires et espaces résidentiels, Programme de recherche en sciences sociales, Etude de l’immigration, Université Libre de Bruxelles, Institut de Sociologie, 1993. BOUBEKER, A., “La reconnaissance publique de l’islam de France : entre gestion locale et communauté d’expérience”, Les Cahiers de la sécurité, No. 62, 2006. DASSETTO, F., “Islam en Belgique et en Europe : facettes et questions” in Felice DASSETTO (dir. ), Facettes de l’islam belge, Louvain-La-Neuve: Academia-Bruylant, 1997. DASSETTO, F., La Construction de l’islam européen. Approche socioanthropologique, Paris: L’Harmattan, Coll. “Musulmans d’Europe”, 1996. DASSETTO, F., “Visibilisation de l’islam dans l’espace public”, in Albert BASTENIER and Felice DASSETTO (eds. ), Immigrations et nouveaux pluralismes : Une confrontation de sociétés, Louvain-la-Neuve: De Boeck Université, 1990. HERVIEU-LEGER, D., La religion pour mémoire, Paris: Editions du Cerf, 1993. KASTORYANO, R., La France, l’Allemagne et leurs immigrés : négocier l’identité, Paris: Armand Colin, 1996. KESTELOOT, C., “L’écologie sociale et la répartition territoriale des étrangers”, in Albert BASTENIER and Felice DASSETTO (eds. ), Immigrations et nouveaux pluralismes, Une confrontation des sociétés, Louvain-La-Neuve: De Boeck Université, 1990. KESTELOOT, C., PELEMAN K., ROESEMS T., “Terres d’exil en Belgique”, in Marie-Thérèse Coenen et al., La Belgique et ses immigrés. Les politiques manquées, Louvain-la-Neuve: De Boeck Université, 1997. MANÇO, U., “La présence musulmane en Belgique : dimensions historique, démographique et économique”, in Ural MANÇO (ed. ), Voix et voies musulmanes de Belgique, Bruxelles: Facultés Universitaires Saint-Louis, 2000. MANÇO, U., “Les organisations islamiques dans l’immigration turque en Europe et en Belgique”, in Felice DASSETTO (ed. ), Facettes de l’islam belge, Louvain-La-Neuve: Academia-Bruylant, 1997, pp. 143‑158. MANÇO, U., KANMAZ, M., “Intégration des musulmans et reconnaissance du culte islamique : un essai de bilan”, in Ural MANÇO, Reconnaissance et discrimination, Présence de l’islam en Europe occidentale et en Amérique du Nord, Paris: L’Harmattan, Coll. “Compétences Interculturelles”, 2004. MERENNE, B., VAN DER HAEGEN, E., VAN HECKE, E., La Belgique, Diversité territoriale, Bulletin du Crédit Communal, No. 202, 1997. METCALF, B. (ed. ), Making Muslim Space in North America and Europe, Berkeley: University of California Press, 1996. OUALI, N., “Le mouvement associatif marocain de Belgique : quelques repères”, in Nouria OUALI (ed. ), Trajectoires et dynamiques migratoires de l’immigration marocaine de Belgique, Louvain-La-Neuve: Academia-Bruylant, 2004. REA, A., Immigration. Etat et citoyenneté : la formation de la politique d’intégration des immigrés de la Belgique, Doctoral Thesis, Université Libre de Bruxelles, Faculté des sciences sociales, politiques et économiques, 1999. 1 Starting point of this research was a working paper by Felice Dassetto: “Matériaux pour l’étude de la construction musulmane dans l’espace bruxellois”, Université catholique de Louvain, Département de Sciences politiques et sociales, 1990. 2 An exception to this rule concerns the inclusion of cultural associations. We explain the reasons for this in our typology of Muslim and cultural associations (see below). For this issue, belonging to Islam also has a “cultural” flavour but this does not necessarily mean that the religious dimension has disappeared. 3 Pop. from a Muslim country: Countries where Islam is the dominant religion include: Turkey, Morocco, Tunisia, Algeria, Pakistan. Source: Populations et ménages, Population étrangère au 1.1.2003, Brussels, National Statistics Institute, 2003. 4 Source: Taxable incomes – tax year 2002, income 2001 (amounts in euros), Brussels, National Statistics Institute, 2003. 5 On this subject see: Ural Manço (1997), “Les organisations islamiques dans l’immigration turque en Europe et en Belgique”, (Islamic organizations in Turkish integration in Europe and in Belgium) in Felice Dassetto (ed. ), Facettes de l’islam belge, Louvain-La-Neuve, Academia-Bruylant, pp. 143‑158. 6 Lexicon The Exécutif des Musulmans de Belgique (Executive of Muslims in Belgium) (EMB) is the State’s official correspondent for the management of the Muslim faith. The EMB manages that which pertains to the “temporal” aspects of Muslim worship (appointment of teachers of the Muslim religion in schools and Muslim chaplains in prisons, registration of persons authorized to carry out sacrifices during the feast of the sacrifice, etc.) and not the “spiritual” dimension of the faith as concerns anything pertaining to doctrine and interpretation of holy texts.